and instantly wanted to try my hand at it! Planned to make it the following weekend and set about acquiring all I’d need throughout the week’s shop. Couldn’t find a chicken quite that small, mine was about 4.3lbs, but everything else wasn’t a problem. The first step was to bone the chicken, I’d boned a duck once, so I had a pretty good idea of what I was doing. However, one side of the ribcage was broken, which complicated the process slightly. Next, we were to assemble the filling, but discovered that the veal was beyond using, it had been in the freezer far too long. Opted to replace it with some extra ham and sausage. The second snag came when, after filling, I tried to roll it, there seemed to be far too much filling (and far too little instruction) to actually roll it. In the end, I resorted to sewing it back up and making it more of a stuffed chicken. While this proved to be rather good, we had all sorts of ideas for improving it next time, such as caramelizing the carrots and some onions, but I still haven’t figured out how one was supposed to roll it! 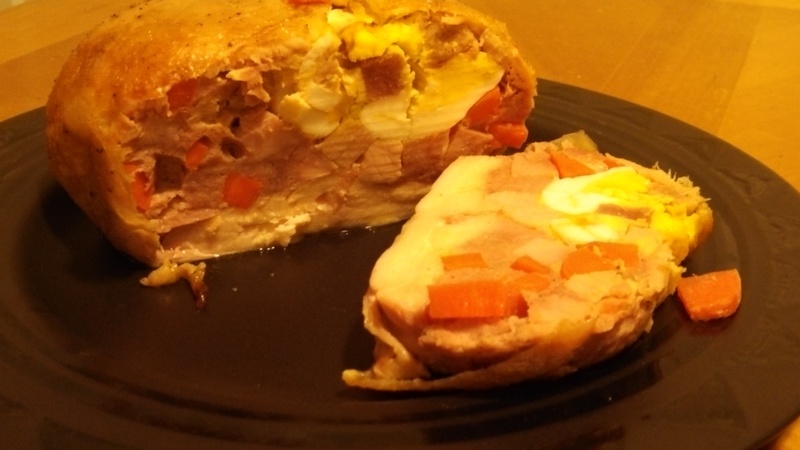 This entry was posted in Chicken and tagged boning, sausage, twine, veal. Bookmark the permalink.